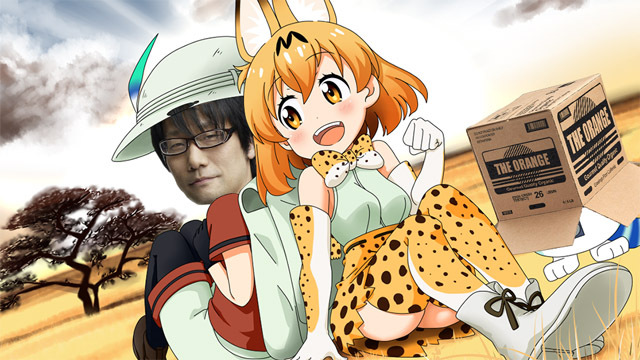 When Kemono Friends director Tatsuki was removed from his position under unclear circumstances, despite the overwhelming success of the anime, speculation quickly turned toward corporate greed. Now, Tatsuki has now found a new ally: Hideo Kojima — a visionary robbed of his future as a result of getting fired by Konami. Together Kojima and Tatsuki have formed a new studio the duo has tentatively called ‘Kojima Friends’, apparently hoping to fight evil capitalists by aiming to become even greater capitalists themselves. The two claim their efforts are still “all for the art” with the new studio confident that it can give fans what they want. Details concerning the studio have been so secret that our Anime Maru reporter was escorted to the location blindfolded. When the blindfold was finally removed, what awaited ahead was a small basement now transformed into a man-cave featuring shady card games and strippers. Both men have a love for animals, so once you survive the lingering smell of sweet absinthe, it is possible to see the jungle-theme the basement has going on. Kojima Friends stated that their goal is to deliver to consumers the content they actually want. The new studio plans to produce additional seasons to Spice & Wolf, Haruhi and even Silent Hill; the main hurdle being that Kojima Friends does not yet own the rights to any of the sequels it has planned. Currently, the directors spend their time playing cards in the headquarters and plotting their next move, occasionally slashing the tires of unsuspecting corporate workers. “We’ve done some extreme things. But the truth is that while we want the studio to have this rebel image, we’re older men now so there’s a limit to how many Kadokawa office windows you can spray paint. Instead of chugging whiskey out of the laps of strippers like we used to, we normally just laze around drinking tea and playing video games,” Tatsuki explains. In a recent interview with Yutaka “Yamakan” Yamamoto, director of the first four episodes of Lucky Star, he confirmed that he had been contacted by Kojima about joining the cause. Our interviewer was kicked out shortly after stating that he’d never heard of Fractale. Despite setbacks, the future looks bright for the new studio with plans to publish their own independent CGI series Animal Tomodachi which isn’t in any way linked to Kemono Friends. The studio has also set eyes on new recruits — Mamare Touno known for his work with Log Horizon and Hideki Taniuchi, known best for his soundtrack for anime Kaiji and Death Note. Kadokawa has yet to comment on the rebel studio, but some of Kadokawa’s future plans have already been leaked. Apparently, Kemono Friends has more surprising staff choices booked for the second season, as the voice actor of one of the main characters Serval (previously voiced by Yuka Ozaki) will have a new voice actor — Kiefer Sutherland. Kadokawa representatives assured us that this decision was “totally necessary”. I for one look forward the Sutherland-kun’s debut in the world of voice acting.